Can't wait to set this up. I have the two MFD's,is that three monitors I see? alpine wrote: I have the two MFD's,is that three monitors I see? It was your pics that inspired me to get the MFDs. 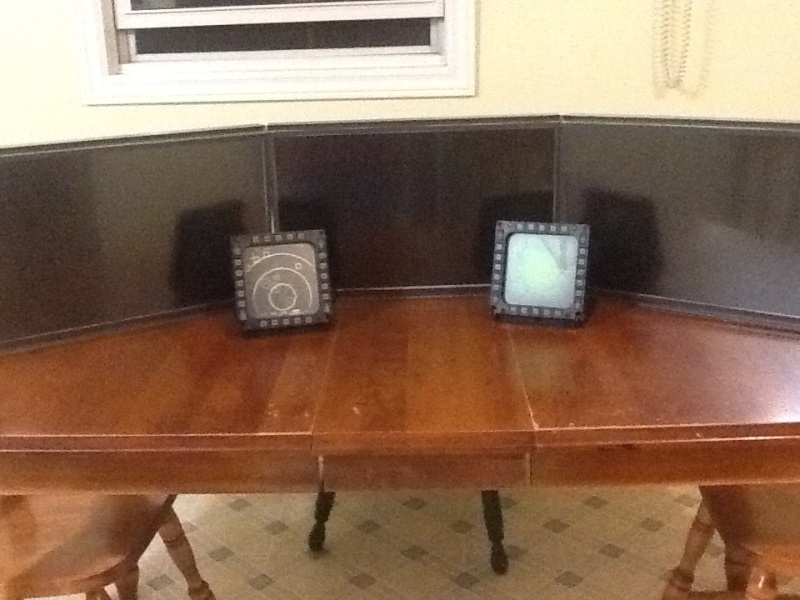 Yeah those are three 20in monitors. Edge to edge glass. No frames. I'm just waiting on a larger desk. I'm not seeing any pictures/screens on this thread, my forum set up wrong? Thanks. I'm all good to go now. So...Can you play Banjo and Cliffs at the same time? Well, I got tired of waiting for my custom mount so I threw this together on Thursday. Can't wait to try it tonight. I've decided the time has come for I as well to do some upgrading. My machine is nearly 6 years old now and it's done its tour of duty and then some. Merry Christmas to me. 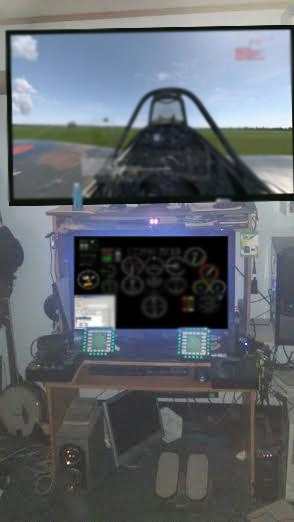 Maybe with this system I can play DCS with good settings. Wolverine that build will be incredible. New machine is up and running! Now for all the updates and re-installs. Ugh. Wolverine wrote: New machine is up and running! Now for all the updates and re-installs. Ugh. I'm trying to feel sorry for you, but then I remember that you have a new PC whose specs border on warp speed. Yes, absolutely do not feel sorry for me. I just tried DCS on full graphics full resolution and it is stunning and smooth as butter. I love my FFB2 stick, but I want something with a few more buttons for DCS. The problem is, there are no better force feedback sticks out there. 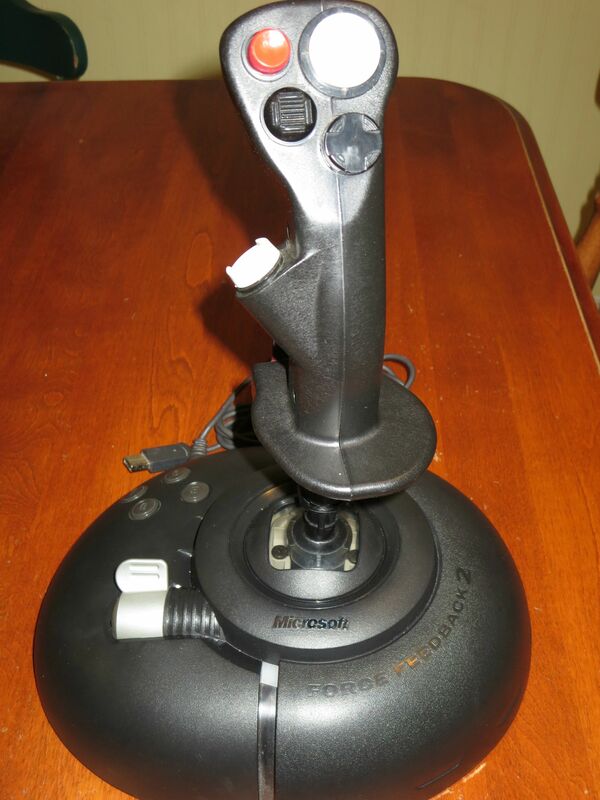 I started researching, and discovered Thrustmaster made a couple of sticks back in the 90s that had nearly all the features of the Warthog joystick and could be found fairly cheaply on eBay. They are the F-22 Pro and the F-16 FLCS. The only difference is there is no button on the counter measures hat switch. No big deal really. I picked up an F-22 for about $30. Fitting the F-22 stick on the FFB2 base was fairly easy. I removed the F-22 shaft from the gimbal and cut it to length. The F-22 shaft is sturdy and thick walled. I used a dremel to to open the inner diameter so that it could slide over the shaft on the FFB2. For now the fit is snug and doesn't need anything extra to hold it in place. That may change as it gets more use. Wiring is next and I'll post about that when I get it done. 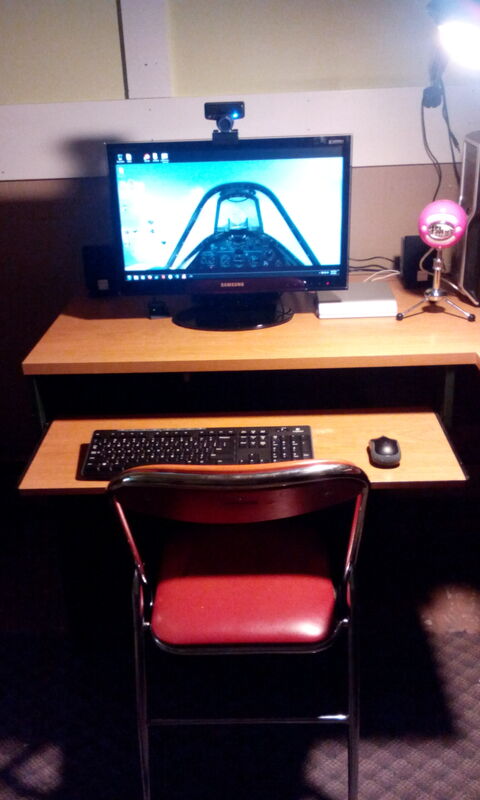 A few bad quality images of my desk as I convert it into my sim pit. It is a self contained unit and only requires one USB port, a power outlet and a video signal. It only takes a couple of minutes to set up and stores neatly at the end of my desk when I'm done. Just my desk. The Hot Pink mic belongs to my daughter. She's on her way to becoming a YouTube star. The orange and chrome folding chair is a relic from the 70s and is as uncomfortable as it is ugly, but it's the perfect size and doesn't roll away when I stand on the rudder. This is how it looks when folded up for storage. The rudder pedals are on a hinged platform. 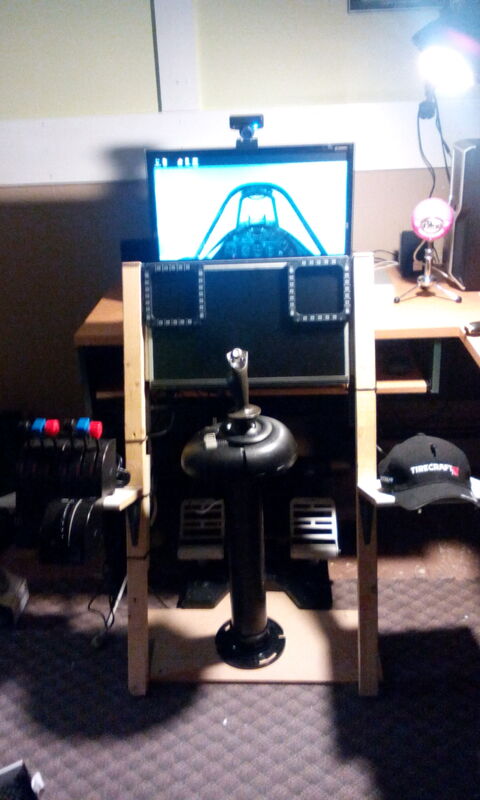 The 3 inch pipe used as joystick stand lays across the pedals. Unfolded and ready to go. The stick can be either center or right mounted. Someday I'll take it apart and paint it. Here is the Teensy Board I used to read the serial data from the F-22 stick. 22 buttons are channeled through 5 wires. 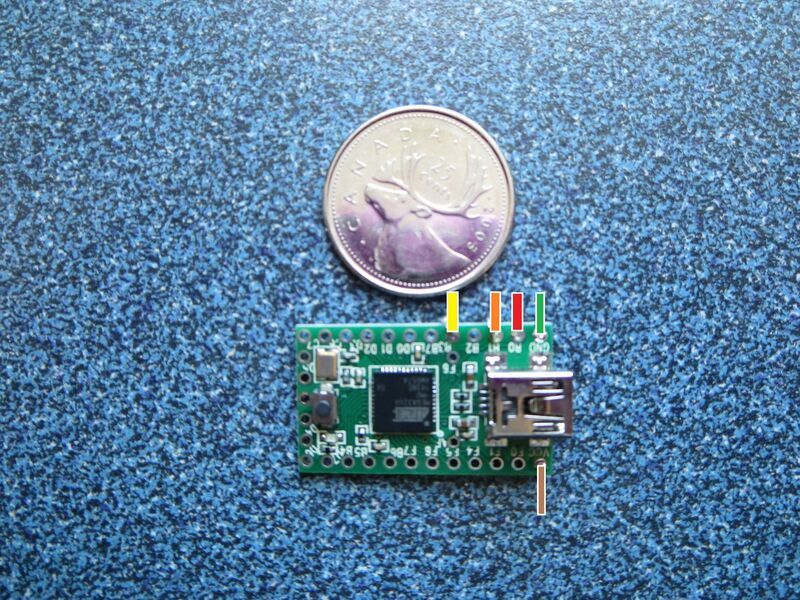 An image of the Teensy Board in the Base of the Stick. The only downside is that the stick now has 2 USB cables. The open connection on the left was from the old stick. Cool stuff.Can you use the remaining outputs for toggle switches? alpine wrote: Cool stuff.Can you use the remaining outputs for toggle switches? I don't think so, but I haven't really dug into it. On the serial bus there is enough capacity to support for 14 more buttons/switches and 6 axis. I'm already working on a switch panel for DCS using an Arduino 2560 R3. So I'm finally putting my i7 860 and GTX 660 out to pasture. I found a good deal on an i5 6600k with 8GB of DDR4 and an R9 390 GPU. Barring any difficulties at the bank machine for such a large withdraw, I should be getting it later today. Cool stuff buddy.I'm thinking of replacing my i5-2500 cpu soon,but apparently it is still a good piece of kit.I'm also looking at dogfightboss.com A10-c flight sim. 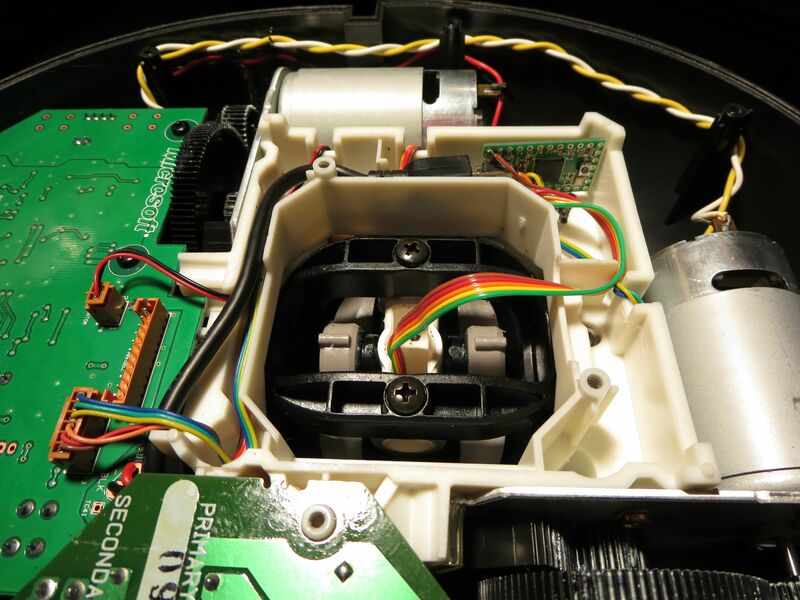 If anyone is interested, here is a great tutorial for building a tactile transducer. You can also buy them. The most popular is probably the Buttkicker. I used an old Cambridge Soundworks sub woofer to make one last summer and mounted it under the seat of my chair. The effect is pretty cool. You get a nice soft rumble when in the air, a distinct thump at touchdown followed by more thumping as you roll out the landing. In Cliffs all you can do is use the sounds in the sim to create the tactile effects. In DCS however there is Sim Shaker, which takes events from the sim and plays sounds to the transducer to create the feeling of raising the gear, firing weapons, ect. I'm in the beta, which added the Spit a couple of weeks ago, and last night was the first time I tried it. The beta also supports FSX and in the future possibly X-Plane and Cliffs. Setup is pretty complicated. For Sim Shaker you need a second sound card, because you don't want to hear those sounds through you regular speakers, but then you lose all the nice rumbles produced by the in game sounds. Voice Meeter Banana lets you mix audio and output to whatever device you want. So now I send in game and Sim Shaker sounds to the transducer, but only in game sounds to my headphones. The one thing I haven't figured out yet is how to separate TS from the in game audio. Lets just say that Devil's breathing results in an interesting feeling. Very cool,will have to look into that soon. 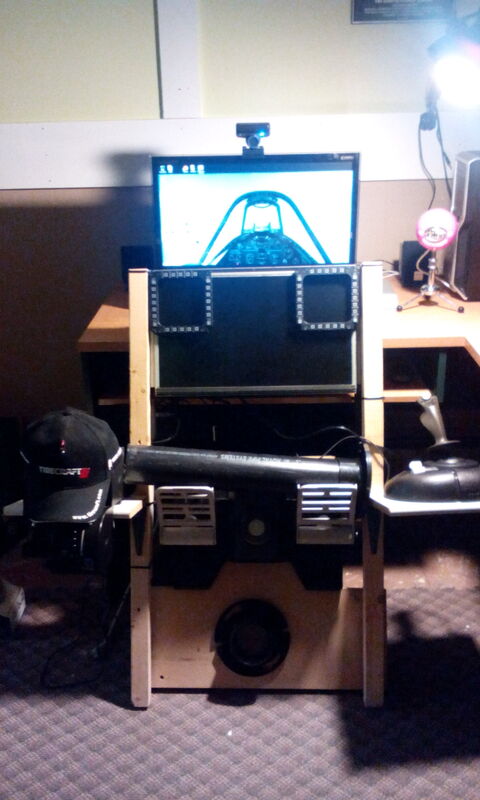 An internet search of home flight simulators turned up some genuinely original concepts. The one built by this guy is fully articulated and you just have to see for yourself. Can't claim to be aiming this high.